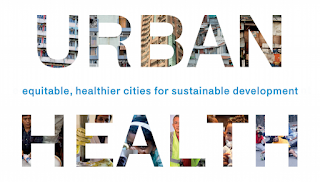 This is one of the key themes of the new WHO-Habitat Global Report on Urban Health: that promoting health in urban contexts goes way beyond the health sector. Yes health systems need strengthening, but the way we plan housing, transport, recreational spaces and water, sanitation and energy infrastructure are also vital--maybe more so. And as the report points out, throughout history most of the worlds cities have not been planned with health in mind. I read the intro chapter, the chapter on nutrition and the chapter on governance. I thought the governance chapter was the most interesting. This chapter covers participation (important but not so easy to achieve in a sustainable manner), citizen empowerment through information sharing (currently working best in high income cities), intersectoral action (difficult, but maybe easier in "place-based" contexts), equity as a core value (is justice easier to build in cities where citizens are closer to their representative governments?) and public-private partnerships (on healthy infrastructure, on generating demand for healthier products, and as philanthropists). Businesses are drawn to cities--can they be drawn to greater health generation as a part of the price of admission? The chapter on nutrition focused on generating sustainable food systems (although the report does not tell us much about how to get sustainable food systems), urban agriculture (not clear why this approach is highlighted when many others are not), food deserts (which is mainly a US phenomenon), the cost of food (the focus in the report is on what the agriculture sector can do to reduce costs, but what about processors, storage facilities, distributors, marketers and retailers?) and local action (may seem like a drop in the ocean, but these can catch on if developed in the aspirational cities). My biggest criticism? There is not enough new data in the report (at least the chapters I read). I was expecting lots of killer facts, but couldn't really find them. Also while the presentation of the graphics is not business as usual, the graphs are really hard work to understand. This feels like a bit of a missed opportunity to feed evidence based advocacy. Overall though, this is a solid and comprehensive report. Socrates would have approved.